Limelight Hydrangea This shrub is a ‘Proven Winners’ plant. Limelight Hydrangea has very unique bright green blooms in mid-summer that then will turn white, then to a light pink and finally to a rose color as it goes into fall. These different colors can appear on the plant at the same time. These blooms make an excellent cut flower. Limelight Hydrangea likes to be planted in full sun or partial sun. The flower heads are of good size, anywhere from 6 to 12 inches across which are held upright on the shrub. Limelight Hydrangea is the winner of the PHS Gold Medal Award. This shrub grows to a height of 6' to 8' tall and 6' to 8' wide. The dark green leaves will turn a bright red in the fall. This is a very colorful plant! 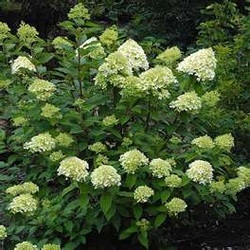 Limelight Hydrangea is a great xeriscaping plant once it has become established. It is also deer resistant. Use as a specimen, accent, a showy shrub border, hedge or in a cottage garden. Limelight Hydrangea is a Proven Winners plant.